Indigenous to Macedonia (where it is also known as ‘Vranec’), Montenegro, Serbia and Bosnia-Herzegovina; and described as a grape that is synonymous with the Balkans. ‘Vranac’ means ‘black stallion’, whilst ‘Vran’ means raven coloured (in South Slavic languages, red wines are typically called black wine). 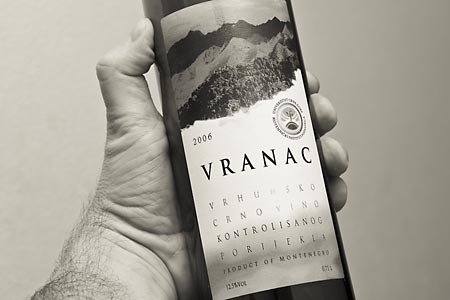 For reviews of wines made from Vranac, please click here. Typical nose of red berries and jammy fruit. To share further information about the Vranac grape, please write to Autochthoinos by clicking here! Great info at last on yummy Vranac! BTW – kratosija, at least in the Crmnica region of Montenegro, is a separate autochthoinous grape variety – lighter in colour & often blended with Vranac in small quantities.